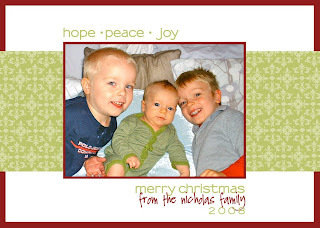 Head on over to SimpleMom for a chance to win your very own personalized Christmas cards! And that's not all...you can also win personalized postage stamps to mail them out with! So what are you waiting for? The SimpleMom blog is what really helped me start thinking about Christmas early this year, and boy am I thankful for that! Now if I could just come up with the "perfect" picture to put on those Christmas cards! Best Wishes!